Here’s another of the single-room-occupancy hotels given a dramatic restoration by the Provincial housing agency, BC Housing, with their private sector partners. The Hotel Canada started life in 1913, according to the building permit, designed by Emil Guenther for T B Hyndman and costing $150,000 to build (by E J Ryan). We’ve seen buildings designed by Mr. Guenther before – he was in the city until 1906, then headed to San Francisco no doubt thinking the disastrous earthquake that year would lead to significant architectural opportunities. He returned to Vancouver in 1912, so this was one of his first jobs after he returned (along with the Hotel Regent on East Hastings). Our image dates to 1974 when it had become the Marble Arch Hotel. In those days there were two other adjacent buildings. The oldest was the one to the south, designed by Parr and Fee (with their trademark centre pivot windows) in 1911 for S Ollison at a cost of $30,000. Who Mr. (or perhaps Mrs.) Ollison was is a complete mystery – there are no Ollison’s in the city around that period. The building next door (with the bay windows) is more of a mystery – it was owned by T B Hyndman in 1912 when he carried out $700 of repairs – (although it seems to have been missed on the 1912 insurance map); it was called the ‘Ideal Rooms’ in the street directory, run by Elizabeth Quigley, with the Ideal Café downstairs. The café, run by William Rosie, had been here longer, so perhaps Mr Hyndman added the rooms just before he built the hotel. There appears to be more to the development of the hotel than the permit suggests. A 1915 ‘Daily world’ article, under the headline “CANADA HOTEL SOLD” reported “Mr. T. B. Hindman is Purchaser From Assignee. By order of Mr. Justice Macdonald the assignee of Mr. Charles G. Muller, former proprietor of the Canada hotel, is authorized to accept the offer of Mr. T. B. Hindman to purchase the property. Mr. C. B. Macneill, K. C, representing Mr. Lockyer, manager of the Hudson’s Bay Company, strenuously opposed acceptance of the offer on the ground that there would be nothing in it for the unsecured creditors. Mr. J. G. Hay, for the assignee, stated that it was the best offer that could be obtained and that the preferred creditors would be paid in full by the proceeds of the sale, which was the utmost to be expected In these times. Mr. J. E. Bird appeared for Mr. Hindman and Mr. T. B. Shoebotham for Mr. Muller.” The first year the hotel appears in the street directory, 1914, Charles G Muller is listed as proprietor. By 1916 it’s shown as T B Hyndman, proprietor and J A Hyndman, manager and by 1922 J E Secord was managing the hotel. We’ve come across Mr Muller before in the context of the Palace Hotel on West Hastings. We thought Emil Guenther might have designed that hotel too, so the two knew each other before the architect tried his luck in California. In 1899 Henry Hyndman of 1075 Burnaby St and Anna Maria Hyndman (wife of Thomas Hyndman) had bought 320 acres of CPR land at $3.00 an acre. In 1901 Thomas B Hyndman and John A Hyndman were both living on East Hastings, and Thomas was working for R G Buchanan Co who sold crockery on Westminster Avenue. Thomas was recorded in the 1901 census as a merchant. In 1904, when he was also active in real estate development, he was vice-president of Woodwards stores. In 1908 Thomas was in real estate, and he and Anna lived at 1075 Burnaby. Thomas Hyndman in 1911 was aged 61, shown as retired and living at 1220 Barclay Street with his wife Anna, and their 29 year old son, John. A 64 year old English gardener, Richard Buckle, and a Swedish servant, Hilda Friedstrum completed the household. Both parents were born in Ontario and John was born in Manitoba. We can’t work out exactly what the business arrangement was that saw Thomas Hyndman obtain a permit for a big new hotel (when the economy was slowing down significantly). It appears that an established hotelier, Charles Muller, took the development on, only to see it revert to Mr. Hyndman within a very few years. No doubt the economy, the war and Mr. Muller’s nationality might all have had a part in the situation. Once the war was over, the Lock Financial Corporation were owners of the hotel, managed by T H Lock. 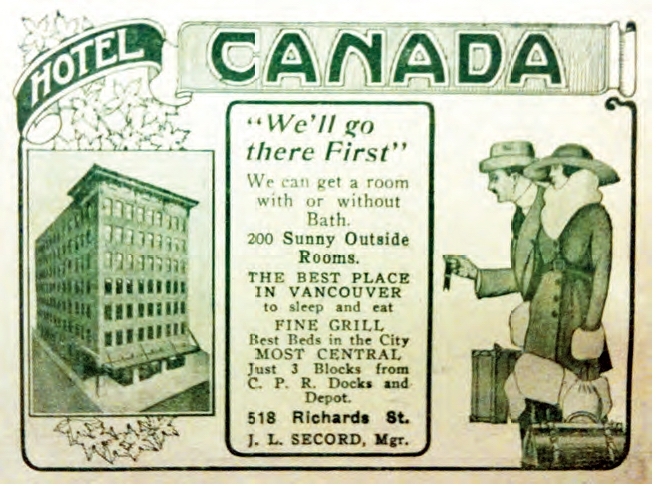 In 1930 the name had been switched – the Hotel Canada was run by J Wyard. Over the years the hotel changed names at least twice more, from 1937 it became the Merritt Gordon Hotel, and from 1941 the Marble Arch. Merritt Gordon was previously the owner of the Invermay Hotel, where we looked at his history. As the Marble Arch, the hotel became increasingly run-down, with the beer parlour one of many in the city that added strippers to bring in clients (said to be at the lower end of the ‘class’ scale). The hotel even got a name check in 1987 when Mötley Crüe named it in its hair-metal anthem “Girls Girls Girls”. Tommy Lee and Vince Neil are said to have spent some time in the bar during the Crüe’s platinum years (our image was probably taken around that time, when the Ollison Block had been demolished). The bar became associated with biker gangs, and a drug deal in the hotel led to successful prosecution of the dealers. A new owner closed the bar in 2002, and by 2013 there were more structural code problems identified with the hotel than any other building in the city. With the recent multi-million dollar structural renovation, and a switch to an earlier name, the building has a much more promising future. Image source: City of Vancouver Archives CVA 778-372. This huge warehouse was the home for many years of Kelly, Douglas & Co. This 1908 Vancouver Public Library image shows the building down the hill of Richards Street from Hastings, with a corner of the Bank of British North America just in the shot on the left. On the other side is Scougale’s Dry Goods, and at the bottom of the hill was the Bell-Irving block. Company history says Robert Kelly and Frank Douglas founded their wholesale grocery empire in 1896, leasing a warehouse in the 100 block of Water Street. Robert Kelly had been in the city for several years. He started out working in a store and telegraph office in Finch, Ontario, and from 1884 he was promoted to manager. In 1886 he moved to California and ran a general store business there and then came to Vancouver where he opened a general store with William McMillan in 1887. After that he became a traveler for Oppenheimer Brothers from 1889-1895. His biography says that Mr. Kelly was short, stocky, brusque and outspoken. In 1895 he left Oppenheimer Brothers and joined William Braid to form Braid, Kelly and Company, wholesale grocers specializing in tea and coffee. That partnership lasted only a year; in 1896 Frank Douglas from Lachute, Quebec, arrived in Vancouver seeking investment opportunities. More easy going, but an experienced business man, he acted as managing director, while Robert Kelly travelled around the Province, using his experience and years of working for Oppenheimer’s to build their business. The Kelly Douglas Company prospered supplying prospectors with provisions during the Klondike Gold Rush of 1898. To meet the stiff competition of long established Seattle and Victoria merchants in the Yukon, Mr. Douglas decided to cover the gold mining centres himself. Each summer he would travel north for several months. In August 1901, after two months in Dawson City, he started back to Vancouver with his order book full. He sailed on the “islander’ and on August 15th, 1901, at 2:00am, six miles northwest of Juneau in Lynn Canal, the ship struck a submerged iceberg. Forty of the passengers drowned including Frank Douglas. Stories were current at the time of his death that between $50,000 and $60,000 was lost with him. It was related that he had secured the gold in his clothing before he drowned. (This seems highly unlikely – that would have been 68 kilos at the prevailing price of gold. If true, it would explain why he drowned). Robert Kelly ran the business for a while, then in 1904 he sold a 20% interest to Frank Douglas’s brother, Edward, from Chatham Township, Quebec. Edward was an older brother and had previously worked in the lumber business for many years, including running Weyerhauser’s interests in Minnesota. The original five storey building to the east was built in 1905, designed by W T Whiteway. The Gault Brothers company moved in later; the building, and their name is just visible – (we can find nothing to substantiate a suggestion that Frank Burnett partnered with Kelly to build the first warehouse, although it’s possible given the death of Frank Douglas). Kelly, Douglas moved here from their previous location on Water Street, added another floor in 1906, and then proceeded in 1907 with a large-scale expansion by building the warehouse to the west, seen here, which when it was complete was the largest warehouse in Canada devoted exclusively to produce. The builder, J.M. McLuckie, proudly advertised the structure as “Vancouver’s first skyscraper”. It was tentatively slated to rise to nine storeys in height. Despite the use of 18 x 18 inch timbers at the base, tapering to 8 x 8’s on upper floors, the building stopped at seven floors. The company obtained a permit in 1910 for another warehouse on Cordova Street, again designed by J M McLuckie, and costing $37,000. In 1911 Gardiner and Gardiner designed a further addition to this building, and in 1912 McLuckie obtained another permit for a $41,000 5-storey warehouse shown at 1106 Helmcken, although almost certainly it was 1106 Mainland Street. That building was used by the Kelly Confectionary Co, a further company created by Robert Kelly. 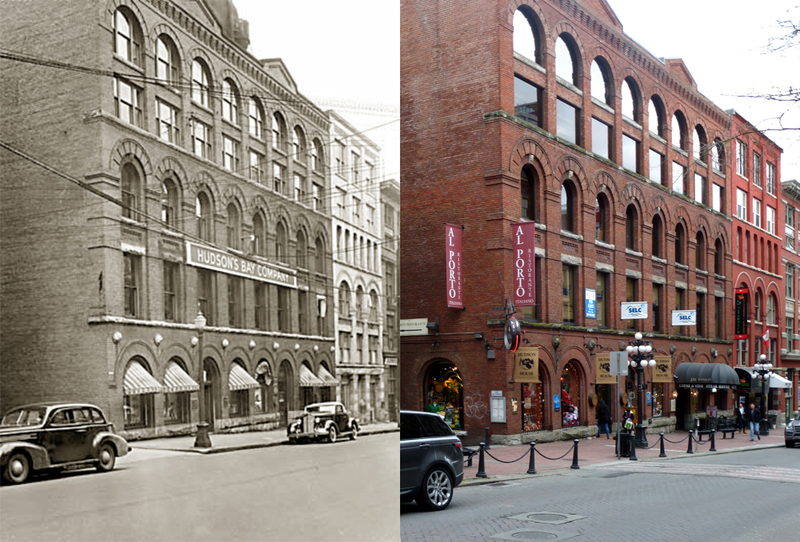 In 1913 J M McLuckie designed a further $40,000 expansion to the Water Street warehouse, and in 1917 A Williams & Co were listed as designers of a further 2-storey addition costing $10,000. We’re not sure if that applied to a part of the building that can’t be seen, or it was never acted upon – clearly the larger building today has the same number of storeys as in 1908. In 1988 Soren Rasmussen designed the conversion of the complex to office, retail and restaurant use, nowadays called ‘The Landing’. This significant heavy wood-frame warehouse was one of the first in this part of Water Street. Built in 1894, it was designed by C O Wickenden for the Hudson’s Bay Company with three floors whose function included the storage of furs and liquor. In less than a decade it was too small, and Dalton & Eveleigh were hired to add $8,000 of additional space on two further floors in 1903. (Dalton had designed the additional floors on both the warehouses to the east as well). Both the original design and the addition utilized the Romanesque Revival, with curved brick arches ending up appearing on alternate floors. This 1941 Vancouver Public Library image shows the Bay continued to use the warehouse over many years, until the early 1950s. It was the company’s general office in the city in 1912, but reverted to warehouse use later. In the 1950s J F Mussenden took over the building as a shoe warehouse. The top floors were gutted by fire in the early 1970s, and the building was rebuilt with Werner Forster supervising the renovation. Renamed Hudson House, it is now used as commercial office space over retail and restaurant uses (like most of Water Street). Here’s the McClary Manufacturing block on the corner, and next door at 311 Water is the Martin and Robertson warehouse built a year later and completed in 1898. It started life as a 4 storey building, and each floor had a different style. It started with a rustic stone base, a square second floor with paired sash windows on either side, Romanesque arches on the third floor and six sash widows on the top floor. W T Dalton was the architect, and as he featured in a brochure, we even know all the suppliers of materials – from Thomas Dunn for the glass to Geo H Hinton for the electrical fittings. 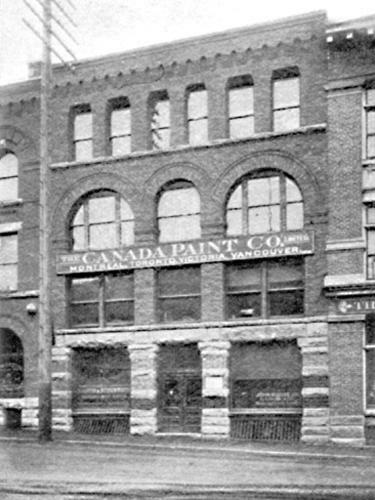 As this 1900 photo from the brochure shows, the Canada Paint Co were in the building in 1900, but Martin and Robertson who developed the building were here too. Although described in some descriptions as ‘Klondike Outfitters’ they were importers and suppliers of dried foodstuffs – not just to would-be miners heading north. In 1903 W T Dalton (who had added the extra floor on McLary’s a year earlier) designed the $4,500 2-storey addition to the building for Mr Martin, built by ‘Horrobin’ – (contractor Theodore Horrobin). Martin was Robert Martin, born in 1851 and Robertson was Arthur Robertson, who we think was seven years younger. Robert Martin was from Ontario, his wife Lydia was English, ten years, younger, and in 1901 they had four children aged seven, six and five as well as a 9-month-old baby. The household was completed by a ‘lady’s help’, Caroline Watson, and Jin, the domestic. Scotsman Arthur Robertson was looking after the company’s other warehouse, in Victoria. Both partners were interested in other investment opportunities; in 1903 the Times Colonist reported: “anticipating the boom that is likely to strike Port Simpson on the commencement of the building of the Grand Trunk Pacific enterprise, speculators are hastening to ‘get in on the ground floor’. Robert Martin of Vancouver and Arthur Robertson of Victoria are applying at Ottawa for a grant of foreshore rights at Port Simpson”. Whether they obtained the rights or not we’re don’t know – they might have been better off being turned down, as the railway terminated in Prince Rupert instead. In 1908 a new 6-storey building was designed for the company by Parr and Fee (although we’re not sure where it was located), although Martin and Robertson were still in this original building in 1910. They were described then as ‘manufacturer’s agents’, and Duncan Gavin was the manager. They moved to new premises in 1911 to a warehouse they developed with John Burns at 329 Railway Street. That could be the Parr and Fee building – although the building permit, taken out in 1910, suggested that they had designed it themselves (which seems unlikely). This building was used by the Northern Electric and Manufacturing Co, who hired Thomas Hooper to design $1,500 of changes in 1911. Their name was truncated to Nortel many years later. The company started life in the 1890s as the manufacturing subsidiary of Bell Telephone of Canada. Martin & Robertson advertised in ‘Canadian Grocer’ in 1918 in their Railway Street premises as Rice Millers, Importers and Manufacturers Agents. They distributed Japan, China and Siam Rices, as well as “BEANS, PEAS, SPLIT PEAS, TAPIOCA AND SAGO, SPICES, TEAS AND COFFEES, PINEAPPLES, DESICCATED COCOA-NUT, CURRANTS, DATES, FIGS, NUTS, SHELLED AND UNSHELLED, RAISINS, Etc., Etc. Representatives in all distributing centres throughout the Dominion”. 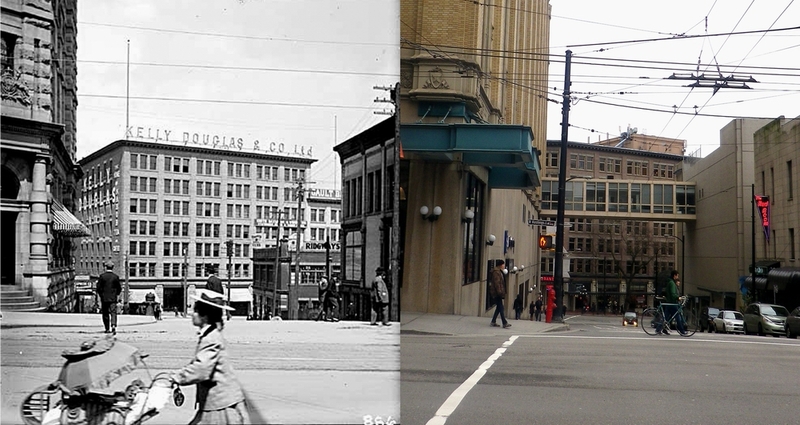 The 1907 Vancouver Public Library image above shows pretty much the same set of buildings that can still be seen today, as they can in our 1970s slide below. The biggest change is that the Martin & Robertson warehouse wasn’t red forty years ago, while the other buildings on the block were. This Water Street warehouse dates back to 1897. Built for the McClary Manufacturing Company, it is the only building in the city designed by the architects. McClary Manufacturing were formed in 1871 and produced stoves, tin, copper, and pressed wares, agricultural implements, and other ironware and machinery, based in London, Ontario. The company expanded across Canada, establishing a Vancouver presence in 1894. Partners John and Oliver McClary were initially tinsmiths in New Hampshire, starting work together in Canada in 1852; Oliver, as an older brother, taught John the skills, and John developed the business. William E. Drake moved to Vancouver in 1892 to work as manager of the Vancouver branch of the McClary Manufacturing Company, and although we can find a reference to him in the city that year, the company’s presence only shows up around 1895 when they were occupying a warehouse a little to the west of this building. In 1898, he was declared the attorney for the Company at its British Columbia headquarters on Water Street. He resigned from the company in 1911, replaced by James Galloway. London-based architects Moore and Henry were hired to design of all the McClary warehouses, thanks to the marriage of John Moore to Oliver McClary’s daughter. The building is Classical Revival – a style not generally favoured by Vancouver’s architects. In 1902 another floor was added in a sympathetic addition, designed by W T Dalton and built by Edward Cook at a cost of $7,000. In 1920 McClary’s were still here, but later in the 1920s they became General Steel Wares of Toronto (who bought McClary’s in 1927), as can be seen in this 1940 Vancouver Public Library image. Now converted to offices, the building has recently picked up awards for the careful renovation supervised by Chercover Massie & Associates, Architecture & Engineering, in association with Donald Luxton & Associates. Here’s another of the diamond-decorated Townsend and Townsend buildings that they designed between 1908 and 1913. They used the motif on many, but not all of their buildings, irrespective of the use. The previous post showed a rooming house on Granville Street – this is a warehouse. It cost $26,000 to build and was built by William McPherson in 1912 – this picture shows it two years later. We’re reasonably certain that the most likely of the several William McPhersons who were living in the city at the time was a Scottish canneryman, who co-owned the Dinsmore Island Cannery with William Hickey. In 1911 he was aged 58, living with his wife Jessie and their domestic, Jane Hastings. Ten years earlier they had a different domestic, Tommy Kado. The cannery was sold to British Columbia Packers Association and Hickey partnered with Robert Kelly (of Kelly, Douglas) to obtain the exclusive rights to seine fish the Smith Inlet salmon run. McPherson had been a partner in an earlier cannery – a very much earlier cannery in Steveston called the Lulu Island cannery which ran from 1891 to 1895 before it was sold and renamed the London Cannery, (it had been demolished by 1911). The 1901 census tells us that William had arrived from Scotland in 1872, while Jessie arrived much later in 1893. William died unexpectedly in 1917. In the picture the tenants were Bernet Bros; Joseph, Ernest and Martin Bernet were from New York, merchants whose warehouse was initially on Cordova, then Granville in 1911 and finally here. Joseph had started in Vancouver as a financial and real estate broker around 1910 in partnership as Bernet and Helm, and from 1918 to 1919 was a wholesale jeweler in a different partnership, Bernet and Gluck. Bernet Brothers seem to have ceased operations in 1914 when they were described as electrical wholesalers and Martin and Ernest Bernet were in partnership as Ernest & Martin Bernet that year. In 1916 G R Gregg & Co occupied the building, wholesaling Japanese Goods and European Silks, with Herbert Geddes as manager. They had moved here from the Buscombe Building, two buildings to the west.